In the fortnight and days since ascending and descending the Glaciered Rock I have thought thoughts inspired by that jutting and cutting piece of frozen nature that at the time I had no capacity to think. Among them: that I should return either or both to Rainier or another majestic hilltop. …but why? I’ll come back to Why in a moment. Mountaineering is not a metaphor for life or goals or achievements. Summiting may become translated into such easy cliches. But while with the mountain your focus is with each pick of the axe, every cramponed step, each inch of rope slack betwixt your partners. Clouds of chaos may engulf you while at sea level – bills, work, health issues, home buying, etc. The only swirling mists that matter two and three miles up a rock face, formations you must be vigilant to spy, are those that accumulate around and near the crown. Such one-mindedness is freeing. Singularity of mission and mind on a mountain takes you to the edge of the crevasse of your soul. …later on, once you can introspect. Which is part of what this post and my other wonderings and writings have been about in the nights since Rainier. This first person view of just one of the many amazing things I saw on the climb is stuck in my head. Has been for weeks. 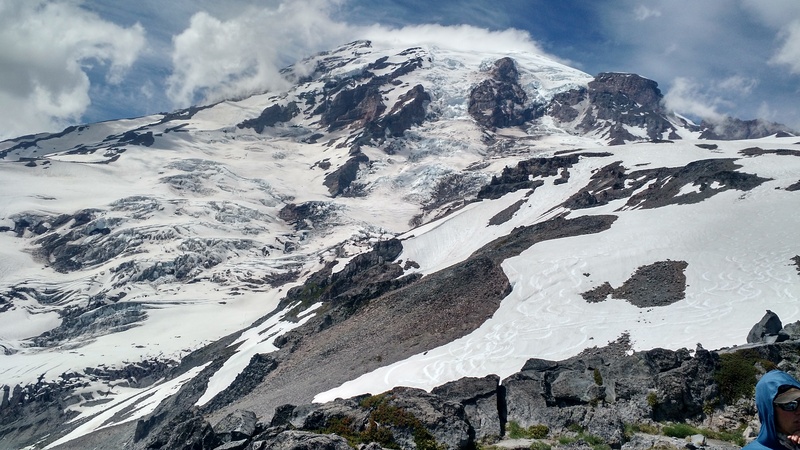 I remember still the first crevasse crossing on Rainier – my first in this life. Bridged by an aluminum ladder with wood planks secured to the rungs, placed by the RMI guides. Casey, our lead guide, instructed us to approach and cross slowly and steadily. Don’t jump, rush, hop, or hurry. Doing so might jar the ladder from its hold. You could slip. You might jerk your rope partners from their footing. 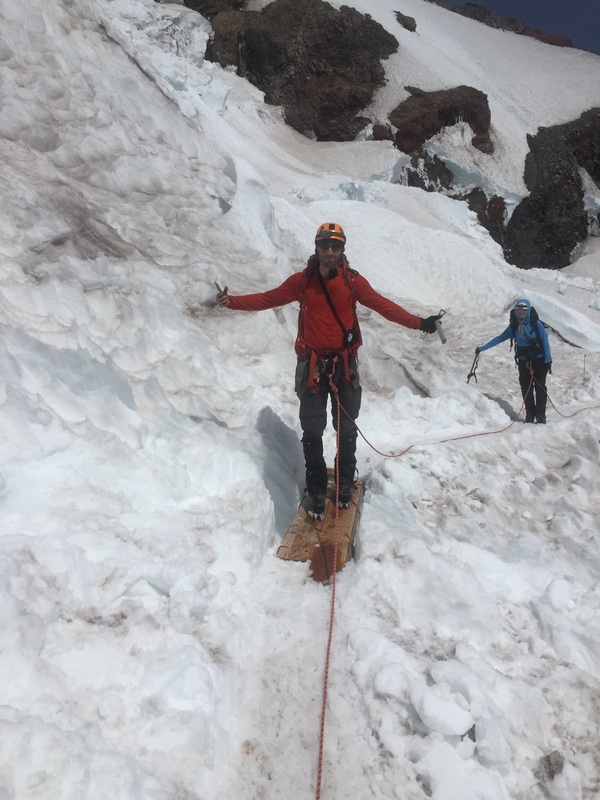 Steady and with confidence – this is how you cross a crevasse. Crossing by any means other than this can bring danger – even if you safely traverse the gaping slit – to your team. Safety is on the other side, almost. Because so long as and each time your roper partners must confront the crossing obstacle you too are reliving that same challenge. 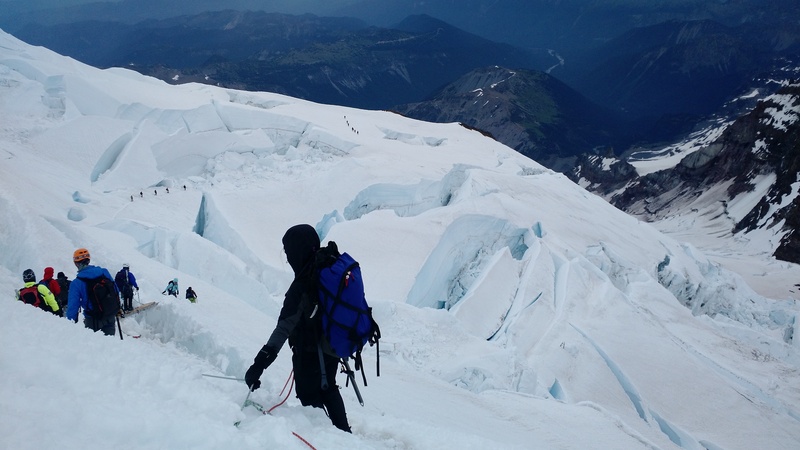 Rope teams and a running belay across crevasse on Mt Rainier glacier. Casey imparted the instructions too late for me. I scampered across like a squirrel flinging itself from one tree branch to the next. Aiming only to have my spikes bite the wood securely and as infrequently as possible during that eight foot span. I didn’t even take time to glance deeply into the blue beauty of the formation. Instead – and for the last time – I made foolish haste. A mistake I would not make again. Ignorance may have been a legitimate excuse. But you don’t usually get to make mountain mistakes twice. We were lucky. Later on, more sure footed and deliberate in our crevasse approaches, I stole once-in-a-lifetime looks into some amazing glacial abysses (see header photo). Deep, cool blues made such by the purity of the pressurized whiteness that had accumulated and smashed down one snowfall upon the next. Over 900 inches per year on average. How to describe those blues? More sure-footed this time across. At the summit ceremony after we completed our journey with that mighty glaciered rock, Casey and Kel provided the vehicle for un-describing those blues. Summoning their inner John Muir, they shared a not-unfamiliar exchange that adventurers and risk takers often encounter: “‘Why do you climb mountains? To get to the top?’ ‘No’ says, the climber. ‘We climb mountains to see things that those in the valleys cannot see. We climb mountains to see things those in the lowlands will never see'”. Which is to say, I don’t think others can see those glacier-fissioned blues. Try as I might to describe them, they may be impossible to see. In part, I think, because it’s not just your sense of sight that is stimulated by the hues. It’s an experience. It’s a moment. In fairness to the valley dwellers, even while in the moment, I’m not sure one rope member on that ice could describe it to another 12 feet behind. Which brings us back to the Why to climb a mountain (again). The sum of these experiences – glacier crossings, rock falls, summiting – are prone to metaphor-making. I want to fight against such commodifying. Some strange bond compelling me to protect the pureness of that time together. Frankly, it’s kind of strange. But it feels belittling to try to embody the thousands of carefully placed steps, the axe bites, the forced breathing (essential for faux acclimatization, thing about forced breathing: like a yawn, one person force breathing consciously…then over time unconsciously, trigger a chain of forced breaths from the rope team), as well as the toe-numbing cold, the miner’s light-engulfing darkness, the snot, the piss breaks, the worry, the focus, the tears, the relief… How do you make a memorable metaphor of a spiritual experience? It’s easy enough, I suppose. But I don’t mean “how do you?” I mean, should you? The Muir passage is a sentiment that wouldn’t have made much sense to me before this particular climb. I’ve climbed mountains before. But Rainier was the most demanding. And the most rewarding. Demanding because of the mental, physical, and emotional intensity of this techical climb. Rewarding in that Rainier gave back to me an introspecting lens to examine parts unknown. It is for this reason that Rossiter’s speech, channeling his inner Muir, resonates so resoundingly post-Rainier. Truth be told, I haven’t yet determined what it is I’m seeing through this lens. But it’s new. It calls. It challenges. It inspires. Most times life’s daily tasks don’t do that – inspire, challenge, pause you for reflection. Forcing yourself into new (and possibly uncomfortable) experiences can help rattle the soul. I’ll tell you this about Rainier, though, I certainly wasn’t prepared for the shake up this has caused. I stand even now over this crevasse, peering into, off of, around, with the glacier. And I see things that I couldn’t see before. They aren’t yet in focus, because part of my mind’s eye still at 14,411 feet.